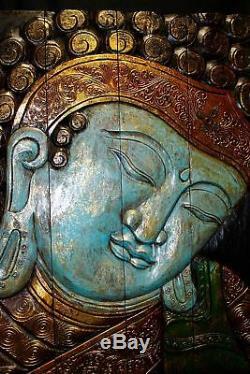 Calm Blue Buddha Panel Folding Screen hand Carved Wood Bali Wall art right 32. 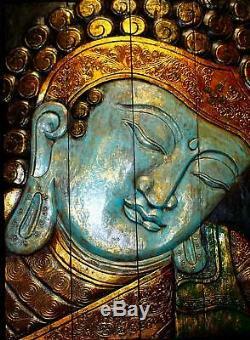 Folding Screen Decorative Buddha relief panel, carved by master carvers high in the spiritual heartland of Bali, this is an amazing spiritual work of art. Carved from 4 thick solid slabs of jempinus wood, the panels are hinged together to form this interesting artwork. 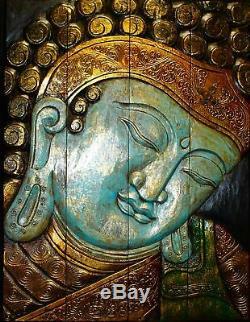 The Buddha is looking to the right, (we also have him looking to the left in our store), they look great hung together. Suitable to hang on your wall or stand upon a table, will surely create a serene focal point in your home or sacred space. The paint is done in a calming blue with an ethereal gold leaf wash and touches of deep green that give this amazing work depth and texture that the photos can not even begin to capture. Each carving will be slightly different. This is not a flaw, but a reflection of the hand made origins of this unique product. Size: 32" tall x 24" wide x 1thick. Hand Crafted in Bali Indonesia. Ships FAST from our shop in the USA. Since 1988 we have ethically sourced and hand picked our products directly from the artisans and craftspeople on the back roads, family compounds and markets of Bali and other Indonesian islands. Our shop in Downeast coastal Maine offers an ever changing kaleidoscope of Balinese folk art, Buddhist & Hindu art, stone garden statuary, wood carvings. Traditional mask, mermaids, winged mobiles, architectural finds, antiques, home decor treasures, batik clothing & silver jewelry and so much more. 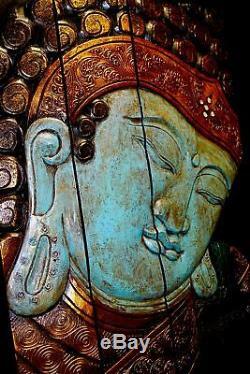 The item "Calm Blue Buddha Panel Folding Screen hand Carved Wood Bali Wall art right 32" is in sale since Thursday, September 8, 2016. This item is in the category "Art\Art Sculptures". The seller is "acadiaworldtraders" and is located in Ellsworth, Maine. This item can be shipped worldwide.